The Grand Weaver by Ravi Zacharias book giveaway. 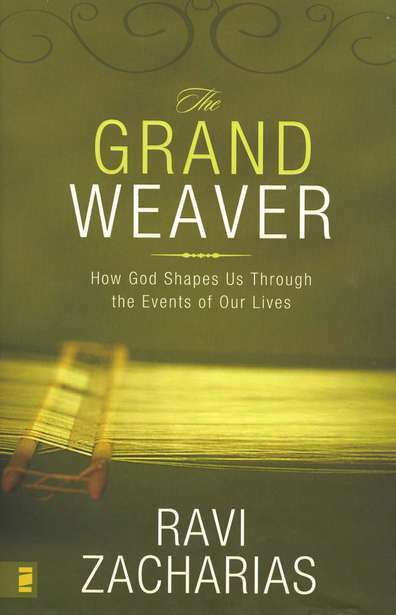 Bitsy Griffin of Jack of All Trades is giving away a copy of The Grand Weaver: How God Shapes Us Through the Events of Our Lives by Ravi Zacharias. Enter by leaving your name in a comment. All the names go in a hat and one winner is drawn on Monday, March 23, 2009. No blog is necessary, but if you have a blog, write a post and link to the original post for an extra entry. US mailing addresses only, book will be shipped via USPS. It looks like an excellent book, and you can't beat the price. Jack of All Trades is a relatively recent addition to the BOB (that's Beauty of the Bible, for those of you not "in the know") blogroll, but it's a great blog. I highly encourage you to check it out.